Cool, crisp and tasty, this salad, stolen from Cooking Light (and modified a bit) is one I’ll be pulling out throughout the summer. The shaved broccoli is not only gorgeous, but easy to eat and the apple/tarragon flavoring? Inspired! Tarragon and broccoli pair well together – the flavors just seem to bounce off one another. Tarragon can be a strong herb and many people seem to have definite opinions about it! If you are in any doubt, just add a little tarragon at first and then more if you like it. I was just about going nuts as I mixed up this salad because the smell began to remind me of the Russel’s Cream of Broccoli Soup with a Cheddar Crust! That soup has a broccoli/tarragon flavoring, too – but no time for soup, today, especially a hot soup, even though its one of my very, very favorites! One piece of advice on shaving the broccoli: Very thinly slice the stems up to the heads, then turn the heads upside down, stem end up. Use your knife to cut almost through but instead of completing the slice, sharply pull away to the right (if you’re right-handed, to the left if you’re not.) The bud end will separate without losing too many green bits. This works better than a mandolin or a food processor and it’s such a small amount it takes just a minute or two. I’ll be bringing this summer salad to Fiesta Friday number 71, an ongoing blogging extravaganza put on by Angie, The Novice Gardener. This week the cohosts are Laurie @ ten.times.tea and Jhuls @ The Not So Creative Cook. Combine vinegar, mustard, salt, pepper and onion (first five ingredients) in a bowl and let stand for 10 minutes. Add yogurt, mayonnaise, tarragon and maple syrup or honey; stir with a whisk. Thinly slice broccoli, see hint in text above. Add to bowl with dressing. Thinly slice apples and toss in a bowl with the lemon and water. Drain and add to the broccoli/dressing mixture. Toss well to coat all ingredients, separating apple slices as necessary. Cover and refrigerate for 3 hours. Stir in bacon just before serving. This entry was posted in Click here for Fabulous Food Posts and tagged Apple, Bacon, Broccoli, Broccoli Salad, Fruit, Lemon, Maple Syrup, Mayonnaise, Red onion, Salad, Slaw, Vinegar, Yogurt. Bookmark the permalink. 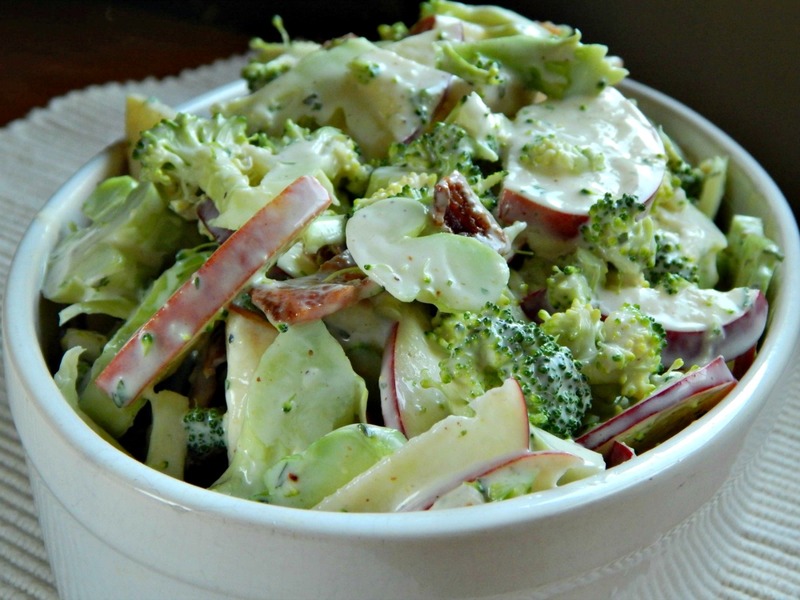 Tarragon, yogurt,bacon apples and raw broccoli? Yes please! Great recipe. Thank you I’m glad you like it. My handle is going to be the name of our food truck. Hi Angie – you would not believe how many people I have talked to that agree with you 100%! I think that any member of the brassica family can be just ruined if overcooked and I think a lot of people must be sensitive to the compounds that can come out with cooking. Didn’t know about the compounds but that explains it. I’ve always wondered why I love raw broccoli but sometimes can’t stand cooked broccoli! Thanks, Lina. We really enjoyed it! Yum! Adding tarragon and Greek yogurt is a great idea! What a creative and interesting salad! I like the sound of how refreshing yet filling it must be (I want to steal Loretta’s description, “robust” from above!) with all the broccoli! I only started using tarragon when it become our only herb to survive the winter and come back (except for the chives and a very, very small and stunted thyme plant) so I’m always interested in seeing more ways to use it! I had to laugh a bit because my chives got so huge I had to keep dividing and dividing and dividing! I think the whole neighborhood has some of my chives. Everything else is a struggle! I like tarragon more and more, so thanks! Such a wonderfully, healthy and robust salad with fabulous flavors and textures. I always like adding fruit to my salads too. Thanks Loretta! 🙂 I think the dried fruit can add a little sweetness and then you can get by with a healthier dressing.